High clearance skid plate, transmission mounting plate and hardware. Made from heavy-duty quarter inch steel, this super tough belly pan protects the underside of your vehicle from off-road hazards. 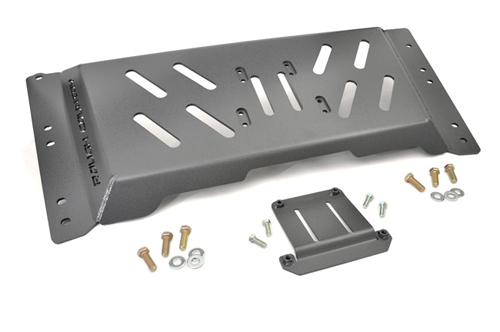 With its innovative design the skid plate sits snug to the vehicle, avoiding hang-ups your factory plate can't and allowing an additional 2" of clearance. The pronounced lip traverses rocks and dirt with ease. A powdercoat helps ward off the elements as well as it gives the vehicle a killer look. Slip yoke eliminator is required - except Rubicon models. CV Driveshaft is required - Rubicon models from 4" up. 1" Motor mount lift is required. 1.25" Body lift kit is required. Rubicon models require 1123 Compressor relocation bracket.